The capes. The gadgets. The weird interpersonal relationships. The goats. Superheroes are straight-up absurd when you think about it. In 1997, a series called Quantum & Woody put that absurdity in the spotlight and won the hearts of, well, hundreds. Probably thousands. Definitely not millions, or else it wouldn't have gotten cancelled. Equal parts hilarious odd-couple sitcom and poignant psychological deconstruction of superhero archetypes, the book only lasted about 20 issues before being disappearing for good. Next year, the World's Worst Superhero team is coming back. No word on the goat, though. Think of the few heroes whose main raison d'etre is bringing the laughs. Deadpool, Plastic Man, Ambush Bug… who else? There's a reason for the paucity of comedic crimefighters in modern comics. One of the toughest feats in all of comics creation is the tricky balancing act between the power fantasy and improbability of superheroics. Even as they're making you bwah-ha-ha or chuckle ruefully, it can't seem like the writers, artists and editors have contempt for the adventuring happening in the panels of their work. Sure, laugh with the characters, at them or even at yourself. But make things too mean, too dumb or too abstract and everything—the jokes, the action, the metaphors—fall apart. 20 years ago, Quantum & Woody—created by Christopher Priest and artist Mark Bright— was one of the rare comics that got that mix right. Then it sadly, abruptly went away. The series homed in on emotional ambiguity of real life in a way very few superhero sagas every have. And if you didn't care about that stuff, there were still side-splitting gags in every issue featuring the salt-and-pepper superhero duo. But the stellar execution was only part of the reason that I personally loved Q&W so much. Christopher Priest was the first black comics creator that I ever knew about. He was the first African-American editor at Marvel and DC Comics, back in the 1980s and 1990s. More importantly, his work dealt with how racial identity acts on interpersonal dynamics and did so in a way that I recognized from my own life. Sometimes, it was bobbing and weaving. Sometimes, it was a series of jabs followed by an uppercut. But the point was he went there. But he wasn't writing polemic commentary; he was writing drama. Priest just managed to find it in a place—the pit of racial misunderstanding and class-centric culture clash—where too many others were too timid to look. Then he stopped altogether, becoming a recluse (sort of like Dave Chappelle) who appeared content to let the world pass him by. Priest's partner-in-crime on Q&W was another long-time comics veteran, with long runs on Batman, Iron Man, Black Panther and Green Lantern to his credit. 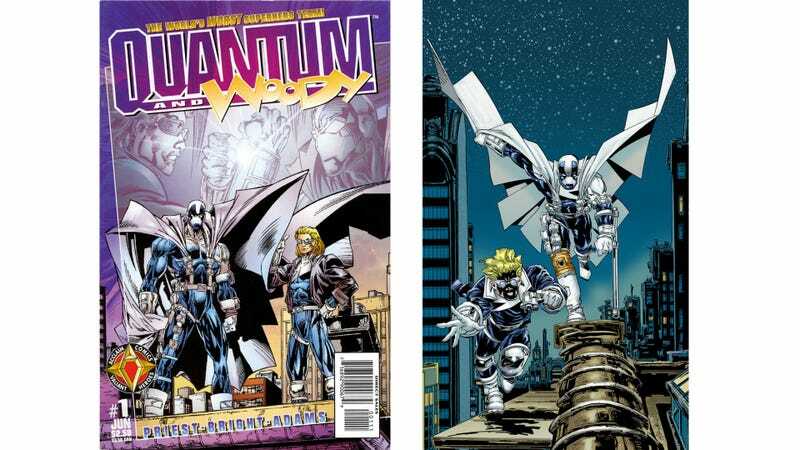 The creators had great work under their belts, but when Quantum and Woody launched from Acclaim Comics, no one quite knew what to make of it. Priest: "...I kind of have two separate lives. This life—the comic book writer—frankly, I keep forgetting he exists. I keep forgetting this entire part of my life exists." The thing about Quantum and Woody is that it felt intensely personal, at times uncomfortably so. The series felt like it was about trying to be something symbolic for the most desperate reasons. Q&W delivered a close-in, cutaway view inside the heads of the kinds of dudes who'd dress up in armor and spandex. And while it was guts-bustingly funny, it also snarled with a mean streak. And then you'd cluck your tongue at the raw sadness that bubbled up periodically. Joke-a-minute Woody? All those quips hid a childhood so messed-up that it made Peter Parker and Bruce Wayne's early years seem like feel-good stories. Hyper-competent Eric? Driven by a deep insecurity borne of feeling like he never fit in or found his true calling in life. But, with both Priest and Bright mostly retired, any hopes of getting their hilarious, frantically layered storytelling seemed permanently dashed. When publisher Valiant Comics relaunched more than a year ago, dared to dream that their favorite dysfunctional buddy team would find their way back to comic shops. One re-booted series and a reprinted run later, it finally seemed like it was time to move on. No way, noogie. Earlier today at a New York Comic-Con panel, Valiant announced that Priest and Bright would be returning for Q2, a sequel that catches up with Quantum and Woody 20 years after they made their debut. Whatever happened to the world's worst superhero team? Twenty years past their prime, the unlikely crime-fighting duo known as Quantum and Woody have long since parted ways and retired…until a middle-aged Quantum suddenly reappears with a brand-new teenage partner—and his wisecracking ex-best friend gets mad. Now Woody is out to break up the all-new, all-different Quantum and Woody and put an end to Quantum's recklessness and child endangerment…just as Quantum sets out to bring down a shadowy, globe-spanning agency of freelance spies and assassins. As Quantum's plan crumbles right through Woody's fingers, will the former friends set aside their differences…and their age…and their numerous health difficulties…to join forces one last time without driving each other crazy? I spoke with both Priest and Bright over the phone earlier this week to find out how they feel about modern-day comics, why they think and the frustrations of being pigeon-holed as a 'black writer. Kotaku: Where do things stand with the ownership of Quantum and Woody? It seems to me that there was a bit of a wrinkle with that. Christopher Priest: I think all of those issues have been resolved. Mark and I are very happy. We’ve got a good relationship with the company and with all the principals involved. There’s no issues. We are holding hands and singing Kumbaya. How’s that? Kotaku: Is this a creator-owned property? Priest: It is 100 percent owned by the Communist Party. [laughs] No. It’s a Valiant property. It’s a Valiant property, and we happen to be part of the family. Kotaku: Everybody remembers the funny when it came to the original incarnation of Quantum and Woody. The thing that always struck me was how incredibly dark and damaged their personal histories were. Do you find yourselves thinking you need to be funny in a different way because it’s a different time now, and can these two characters possibly get a happy ending? Priest: Oh, come on. [laughs] Mark and I are both pretty dark as well, which is probably why we don’t get much work in the industry. No, I’m kidding. That’s a really good question. You’re kind of stumping the band here. I certainly wouldn’t want to give away the ending of what we’re doing. I know I never really saw the book itself as being dark, but certainly having a troubled childhood, a troubled past, a lot of that is used for fuel. A lot of comedians will tell you, that a lot of comedy comes out of personal challenges or personal pain in their lives. It just seems like I was always intending to write a drama that had comedic elements to it and not so much like a comedy or sitcom. The dramatic parts are grounded in a set of circumstances that kind of put these guys together. I don’t know of a way to beat that without there being some darkness to that palette. Mark Bright: Oh! You mean that kind of happy ending. I was going to say, I’ve been going to church for the last 10 years. I can’t draw that kind of stuff. Kotaku: [laughs] There seems to be a giant metaphor in this series' core idea, an older Eric and Woody coming back to action in a world that may not need them. The way comics tell stories has changed. What do you think you can impart on younger readers, younger creators, that you guys used to do the quote unquote old days? What lessons do you think can be given there? What do you feel like you have to learn from the way comics tell stories now? Priest: Nothing. I have nothing to impart. Anytime I get an email from someone who is either new to the business, or trying to break into the business, I warn them off as fast as I possibly can. I’m the last person you should ask about any wisdom to impart here. I think just from my personal perspective, I think comics these days, they move incredibly slowly. Two guys walk in a bar, that’s three pages of a comic book these days. As opposed to you go back to the ‘60s, or even to the Golden Age, and you’ll see a standard nine panel grid and then a standard six panel grid, where things happen and things get done. I imagine what I’m doing is somewhat more dense than the typical comic these days. Maybe it’s paced a little bit different, but you have to factor in that I’m very old and I’m not changing, so there it is. Kotaku: Mark, what’s your answer to that? Bright: I don’t like drawing full page splashes. I prefer to try to tell the story in lots of little panels so I don’t have to put in that much detail. They hold down the storytelling. That’s what it is. That’s what I miss in a lot of comic books that I get now. Lots of people who draw really well but sometimes you can’t tell what’s going on in the story. You always want to be able to tell a story. Priest: Oh, by the way, I spent all weekend adding splash pages to different spots in the story because [Valiant editor] Warren [Simons] made me do it. Warren made me do it. No. I’m kidding. I do think it opens up the book. But I’m seeing a lot of comics these days where it’s three pages and each panel has a one word balloon with five words in it, and it takes them three pages for two guys to walk in a bar. That part I think is, I’m not trying to say it’s better or worse than what we did. It’s not what I do, let’s put it that way. We’re certainly trying to strike some middle ground here. But I think that Valiant went to an excruciating amount of trouble to first get my attention, and second, recruit Doc and I to do this project. I have absolutely no idea why unless my uncle or somebody is holding a gun to somebody’s head down there. But they went to a lot of trouble to get us. I presume they knew who we were and what we did. Hopefully, we’re not disappointing them or they’re not going, “Well why don’t they write and draw like the young people coming into the industry today?” Because we’re not the young people coming into the industry today. We’re people who did what we did 20 years ago. I’ve been at this for 35 years. Warren made me do it. There you go. Kotaku: Priest, you’ve been radio silent for so long that it's surprising to hear that you kept up with anything all that was going on in modern day comics today. What strikes you as really good or really bad? What's made you keep your hand in? Priest: Actually, my hand was not in and that was part of the problem even getting this project off the ground because I kind of have two separate lives. This life—the comic book writer—frankly, I keep forgetting he exists. I keep forgetting this entire part of my life exists. I’ll come out of my coma every couple of years or so and start scribbling stuff on my website and, just when people are talking to me again, I wander back out of the gate and I’m just lost again. But, basically, these days I’m a professional designer. I do branding for small business. I do some other things that have nothing to do with comics. I’m also an ordained minister. I assist a lot of pastors in churches here in Colorado Springs and other parts of the country. My focus is 180 degrees away from the comic book industry. I don’t even know what’s going on or who’s hot or who’s doing what or what book is selling. All of that escapes my radar to a great extent. Kotaku: [laughs] I know where this is going. Go ahead. Priest: I made it known that I used to be a writer and now for some reason I’m a black writer. That’s not really what I want. We started kicking ideas around and he said, “We’re looking for some possibilities with Firestorm.” We had a very long conversation. Several hours. Two or three hours about Firestorm. Some ideas about it. Blah-blah-blah. I said, “OK, the guy with the flamed head, the head’s on fire. I remember him.” He said, "Why don’t you start working on an idea for it. Look up a bunch of reference on Firestorm, and we’ll talk again tomorrow." Kotaku: But I have to say this as a black man, I was deeply impacted by the careers that you two had and the characters that you worked on. They became symbols, whether you wanted them to or not, for black comic readers looking for reflections of themselves. Priest: You mean Green Lantern? That book that we worked on? Emerald Dawn? Action Comics Weekly? Power Man and Iron Fist? There was a black guy in there, I give you that. That’s true too. But I wrote Spider-Man for a very long time, a very long time. Kotaku: You edited those books, too. I was a big fan of a View From the 27th Floor. I remember the column you did about sequencing on a Prince album. I’m dead serious. And how, “Hey, if you sequenced it this way it actually sounds better.” I don’t remember which album it was. But this was an important milestone—no pun intended—for me as a young reader. The question I’m leading up to is, “Do you feel there’s still a need for these kind of symbols?” I understand you may have some reluctance about wanting to be “that guy.” Do you still feel like people need creators like that to represent just the possibility that they can make it in? Priest: Well I think so, but I think that they need, in terms of that function, a creator who’s writing Captain America. They need to take him seriously as a writer and is not marginalize him as a black writer. I was writing Captain America. When Marvel Knights decided to discontinue their Captain America book, what Marvel did was they said, “OK, look, instead of moving me and Joe Bennett—a black guy and a hispanic guy—to the main book, what did they do? They took Captain America out of my book and they were going to make my book "The Falcon.” That’s when I threw my hands up and I just went off and said, “Let me just do something else for a living. Kotaku: You’d written the Falcon before and you guys broke some ground in that book, too. Priest: Yeah, an no offense to the Falcon. But you understand what I’m saying? I felt like somebody is finally taking me seriously. I’m writing Captain America. Then they take Cap out of the book, and they go, “I got an idea, we’re going to let you write Snap Wilson as the Falcon,” which I would have been happy to do if it had been my idea. But it just got to the point where at some point I just realized this is what’s happening to me and I don’t want to do this anymore. It wasn’t fun anymore and I didn’t want to do it. Kotaku: Doc [Bright's nickname], same question to you. How do you feel about the representations of creators, characters as it aligns with your own career? Bright: I don’t have anything nearly as traumatic as Christopher. I feel horrible for saying this. But lots of it was the chance to create a character by myself. By myself and Christopher. But really when Quantum and Woody came along the comic book industry was imploding. The stuff that you had an opportunity to do was really uninteresting. When Acclaim/Valiant...well actually Christopher got the gig. He said, “Do you want to work on it with me?” I said, “Well, yeah.” We’ve killed how many books? We’ve killed Power Man and Iron Fist. We almost killed Green Lantern. There was something else that we killed wasn’t there? We said we can kill another book. We can kill another book. It took us 17 issues. But we did kill Quantum and Woody. Actually I think we destroyed [then-publisher] Acclaim at the same time. But, honestly it was just the chance to be able to work with somebody that I could collabrate with. It makes a big difference having a little bit of input on what’s going on instead of just being surprised and saying, “Oh, OK, we’re fighting a werewolf this month.” It was just different. I liked what we came up with. We could have come up with something that was really stinky. Now granted, we did get canceled twice within 17 issues. Maybe what we came up with was really stinky. But while we were doing it, it was a great time. I just wish one of the guys flew regularly. I like characters who fly. Kotaku: But you say that about the original run of the book, but this is something that people have been asking about ever since Valiant relaunched as a publisher. What do you think is the appeal of these characters and why do people like them? Priest: I’m sorry. Of Quantum and Woody? Those characters? Bright: Judging from the interviews that we’ve had recently, everybody is just waiting to see what the Goat’s been doing. Valiant PR Guy: That’s not true. Bright: Yes it is. Maybe Valiant re-launched the wrong book. Priest: [laughs] Yeah, we should have re-launched the Goat as its own series. Bright: We’d like a piece of that one too. Priest: I think the appeal of the characters is that it deconstructs the superhero aesthetic. We’re mocking the superhero genre while not mocking the fans of the superhero genre. In other words, the fans get to laugh along with us. We’re not making fun of them. We’re just making fun of the absurdities of people wearing these costumes and rope climbing the outside of a skyscraper when there’s perfectly good elevators inside. That kind of stuff. Kotaku: Fair enough. You guys were working, you were doing sharp work, ground breaking work in superhero comics before it became these engines for big deal Hollywood entertainment. Is there any trend, any event, any happenings that you find heartening? Is there anything particularly maddening about the current comics slash nerd-media landscape to you? Bright: Yeah. The guy who did Iron Man 3, obviously didn’t see Iron Man 1 and 2. Kotaku: You know a little something about Tony Stark, Doc. Bright: Yes I do. In the whole movie, Iron Man has his whole armor plugged in. In Iron Man 2, he’s made that new chest piece that powers it. What’s this "Iron Man’s got to plug in his armor into a wall outlet" stuff? Kotaku: That’s like Stan Lee/Don Heck-era stuff. Bright: Yeah, but by the same token, I really liked The Avengers. The really sad thing is we’re not really getting any compelling stories out of it. It’s set up, who they’re going to fight, and then stage the big fight. Again, The Avengers was good because I liked the characters, the way that Joss Whedon handled the characters. But I’m a big Joss fan because I liked Buffy. I liked Angel. Wasn't so jazzed about Dollhouse. Priest: I don’t really find much heartening about it because I was hoping that the success of the films would translate into much bigger business for comics. I am surprised to learn after being away from comics for so long and not paying attention, that comics actually still exist, and that there is apparently enough money in the business to make guys like Dinesh want to invest in it. That’s heartening. That’s the kind of writing I want to do. Thank you, Frank. That’s the kind of writing I want to do. That’s the kind of effect that I want to have on readers. That’s the kind of film frankly that I want to see. Free plug. Go see this Gravity movie with Sandra Bullock. Terrific writing. Unbelievable writing. Very good. I liked it very much. That’s what I’m talking about. That’s a movie. Make me a superhero movie that rocks like that and I’m in. Kotaku: I got one more. This is primarily for Priest, you talk about forgetting the other part of your life, the comic book centric part of your life. Is this you shaking off hibernation? What will it take to get you to answer the next email about a sequel to Spider-Man vs. Wolverine? Priest: I pitched that. I pitched it twice. They turned it down. The first time I pitched it they said, “Nay, no thanks.” The second time I pitched it they said, “Oh wow, I wished you would have sent this in a month earlier. We just commissioned that.” They’ve apparently done something a couple of years ago that was kind of a sequel to that. I won’t speak for Mark, but I’ll pretend to speak for Mark. We were both completely chagrined after the success of Spider-Man vs. Wolverine that they never approached us to do a sequel and they never got Chris Claremont or somebody to do a sequel. Why they never did a sequel is obviously a Marvel question. But I was like, “Oh wow.” This goes back to the whole writer versus black writer thing. I feel like anybody else that would have had a success like that, and that thing was hugely successful, anybody else would have landed a gig somewhere. That did absolutely nothing for our career. To this day, we’re still waiting on that phone call. At some point somebody is going to go, “Oh, Spider-Man vs. Wolverine, we should probably put these two [creators] on something.” It did absolutely nothing for us. Now, was that a black thing? Or was it because at the time I worked in the office and I wasn’t the most popular fellow around. That’s a matter of debate. This is what I’m saying, anybody else that would have done a book like that that successful, it would have been a career boost. It did nothing for us. I wonder why? Kotaku: In terms of being an active writer in comics again, is that something you have time for or have interest for? What are the conditions there? Kotaku: Fair enough. If somebody had to play you...let’s say they were making a movie about the heyday of Marvel Comics in the ‘80s, if somebody had to play you in the movie, who would it be? Priest: Play me in a movie? Priest: Oh man. I think the guy I would want to play me is dead. It was Norman Jewison’s play, A Solider's Story. I can’t remember the actor’s name. The guy who played the sergeant. Kotaku: Yeah, the gravely voiced light-skinned brother. Priest: Yeah. Google him and put his name in there. That’s the one I want to play me.